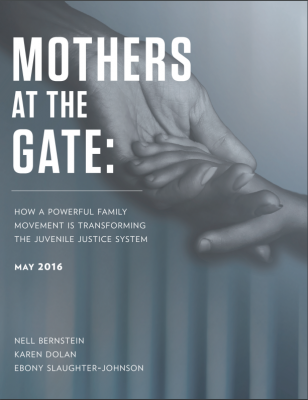 The Institute for Policy Studies’ new report, “Mothers at the Gate: How a Family Movement Is Transforming the Juvenile Justice System,” notes that “54,000 children are incarcerated in this country — the most of any in the world. … Incarceration is one of the greatest civil rights issues of our time. It’s not just millions of adults, but also staggering numbers of children, who are roped into the criminal justice system. “This report reflects an effort to map a movement of family members — particularly mothers — that aims to challenge both the conditions in which their loved ones are held and the fact of mass incarceration itself, and to distill the shared wisdom of its leaders. Dolan is a fellow at the Institute for Policy Studies and directs the Criminalization of Poverty Project. She co-authored the report with Nell Bernstein and Ebony Slaughter-Johnson. She said today, “Many mothers will be sharing a lovely breakfast in bed this Sunday. But in a nation that incarcerated more children than any other country, over 50,000 mothers will be feeling the pain of their child being locked away, behind bars. Most for minor offenses. Some of these mothers are part of an emerging movement of families who are fighting back against an unjust system. Through direct experience they have become not only tellers of their own heartbreaking stories, but policy experts, lobbyists, activists and educators. They are preparing testimony, providing support and training to other families, promoting alternatives to juvenile incarceration, and developing positive models of restorative justice and community reinvestment. They will be spending this Sunday crying for their absent children, but also fighting like hell to bring them home and end the barbaric practice of imprisoning children. Grace Bauer-Lubow is the co-founder of Justice for Families, a national alliance of local organizations committed to ending the youth incarceration epidemic. McClard became an advocate against youth transfer into adult prisons after her son killed himself the night before he was going to be transferred to adult prison, days after his 17th birthday. She is the founder of Families and Friends Organizing for Reform of Juvenile Justice Missouri.